Many of you have not heard of volumetric concrete production and may wonder why this compared with ready mix concrete? The answer lies in the trucks numerous capabilities compared with a ready mix truck. A ready mix truck refers to a truck which has a large drum on its back that has material poured in at a batch plant, delivers to the site, mixes while it is driving, and upon arrival dumps out what is has. 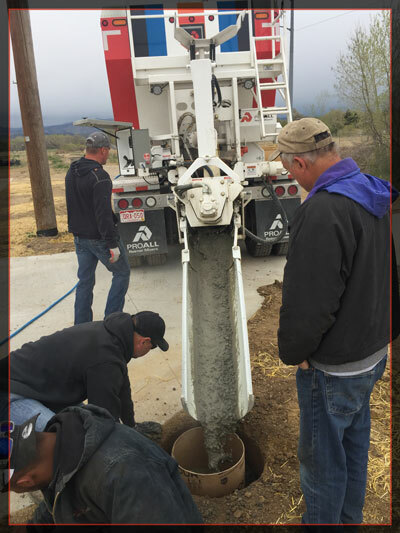 A volumetric concrete truck allows you to batch at a job site. 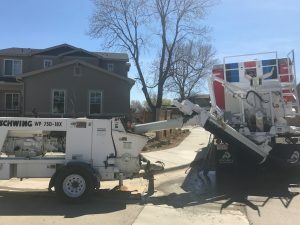 It is distinctly different in that it has 4 compartments for rock, sand, water and cement and the truck, after being calibrated, can pour any psi mix, flow fill, shot-crete or other merely by using it’s on-board computer to put in how much of each ingredient needed to make the concrete. So the question is why would I want to use this? Our concrete always comes fresh, it will not be “hot” or ready to set up because it has been in a drum for 30-45 minutes. You have to add water to concrete that is “hot” because the water is already activating the cement and the chemical reaction and when you add water, the concrete weakens. Our fresh concrete will reach a higher PSI rating due to its freshness. Sometimes the concrete comes too wet. You don’t have a choice but to use it that way, the batch plant messed up or perhaps there was more water in the material than the batch master realized. Not a problem with a volumetric. With the touch of a button, we can add or decrease water right on site and get the slump exactly correct. 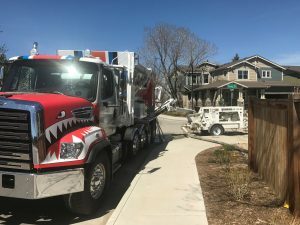 Don’t forget customers, we handle residential and commercial concrete pouring in Colorado, Loveland, Greeley, Longmont, Fort Collins, Wellington, Timnath, Eaton, Bellvue, Evans, Firestone, Berthoud and all along the Front Range. So large or small, contractor or homeowner, we service them all. Thanks for your interest and let On-Demand Concrete service your next pour for the strongest, freshest concrete you can get.